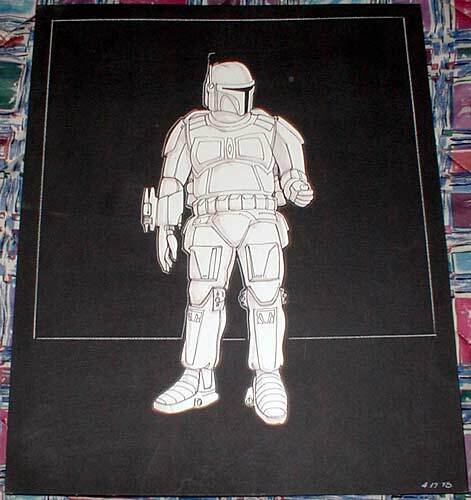 This rather interesting illustration is probably the earliest known piece of material relating to the development of any of Kenner's several Boba Fett toys. It's rendered in what appears to be a combination of ink markers and light water color washes. This work was done on a separate piece of paper, cut out and then pasted to the piece of sturdy illustration board on which you currently see it. As you've probably noticed, the image doesn't resemble the toy as it was eventually produced; it's more of a character sketch than a representation of the actual figure. This is probably because the piece was used only to represent the 12" figure concept in very rough terms, at a time well before the figures entered three dimensional development. However, you'll notice that the scale of the image closely corresponds to that of the Fett figure, it being around 12" in height. What is truly notable about this piece is its color: the character is depicted as being outfitted in all white armor rather than the distinctive green/gray combination that we've all become familiar with. This is because it was based on extremely early conceptual designs of the character done by Lucasfilm designer Joe Johnston just a month earlier. As anyone who has had a gander at the fabulous Star Wars Chronicles book knows, these early Fett designs did indeed show the character as being garbed in a whitish outfit and known as the Supertrooper at that time. 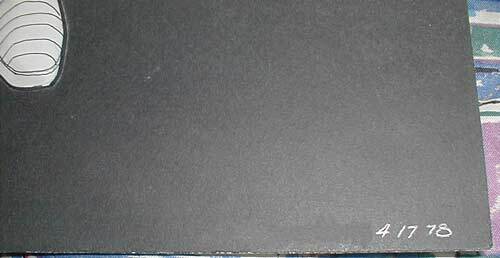 In fact, this Kenner image resembles those Lucasfilm designs in quite a few respects, suggesting that the artist behind it followed his reference material fairly closely. I think the early nature of this rendering is fully realized only when one notices the date in the lower right corner of the illustration board. It was done in April of 1978, less than a year after the original Star Wars film hit theaters and over two years before The Empire Strikes Back debuted and Boba Fett was first seen on film. This illustration and it's companions (three others are featured on the Archive) are some of the largest and most detailed pieces of conceptual art to have surfaced from this early in the development of the Star Wars line. And it's fantastic to be able to see them, as they allow us to peek into the early development of these familiar toys.